← And The Winners Are………. I always wondered about Caponata! Now I have a family recipe in front of me. Would it be okay to go lower on the sugar part. I love the flavors going on there in the dish. I only used 1 tsp of sugar, my tomatoes were sweet. I remember the caponata I had as a child and I liked it in theory but it was way too sweet for me. It’s kind of like an Italian ratatouille. Thanks Sonali. That’s right, with a big hunk of cheese, amen! Yes to cheese and warm bread and a glass of wine. It’s a meal for me. Thanks Sue. Thanks so much. It’s a wonderful small meal! I don’t know where my sense of culinary adventure came from… this is so far away from anything i would have seen as a child or young adult. But it sounds wonderful — especially with the bread, cheese, and wine. Lovely choice, Suzanne. Great-big-hug! Thanks so much Teagan. Growing up in an Italian household was great but there were foods I never tasted also. I love foods from everywhere, it’s great to get to know a culture through their food. Looks great Suzanne, such a delicious appetizer reminds me of ratatouille, I love eggplant! It is the Italian version of ratatouille. Thanks so much Viviana! Hi Suzanne, another great dish, love these flavors together, great presentation. Yummy! Could zucchini sub for eggplant or is it too mushy? Yes you could just add the zucchini at the very end so it doesn’t get mushed. Thanks Linda. I am just about to go out and pick some fresh eggplants. This is the perfect use for them. Thanks so much for posting. Lucky you with a garden with eggplant, I love it. Thanks so much Hilda and thank you for co hosting this week. My pleasure. And yes, I am lucky, but am crossing my fingers that the frost won’t come too soon. I still have a pile of small ones that need more time. This looks so tasty – I’d never heard of Italian ‘tapas’ until recently (I thought it was particular to Spain) when I went to an Italian ‘tapas’ restaurant in London. Oh my – it was just wonderful – so many tempting things on the menu – I think we tried just about everything. In my opinion it’s better than Spanish tapas. I will have to agree with you, not just because I am Italian either. Thanks, this was always on the menu for an Italian tapas in our family. Thank you. Thanks Chitra, it’s a wonderful vegetable dish, thanks so much. It is fabulous with game, it was always served as tapas or an appetizer in my home, thats the way I grew up eating it. I think it’s so similar to ratatouille and is perfect as a side. Thank you so much. Absolutely, thats the best way to eat it. I thought it looked especially good on that cutting board, wink!! I saw that! Have you been using it? LOL, thank you the title is a bit off I know. I love this recipe, no anchovies here thank you. I hope you enjoy the recipe. I also make it less sweet than most caponata. This looks so tasty, Suzanne!! Yum! Thanks Patty! Kiss Bailey for us! 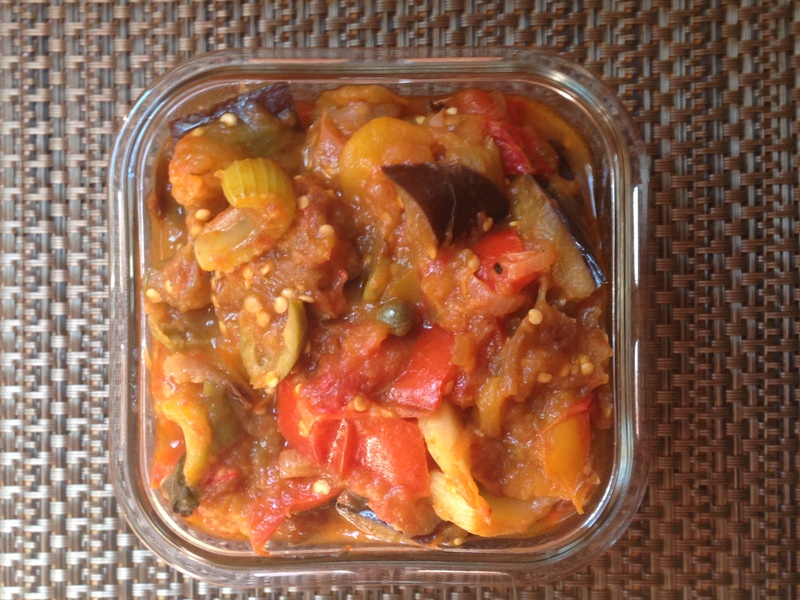 I love caponata Suzanne – thankful for the reminder of it. Lovely looking recipe. I do too, It is very versatile, a condiment, a side an appetizer. Thanks so much. Oh lucky with fresh eggplant. One day I will have a vegetable garden. Thanks Angie. It’s quite popular in Italy or Sicily. Thanks so much, with all the fresh vegetables it’s a great dish to make right now. 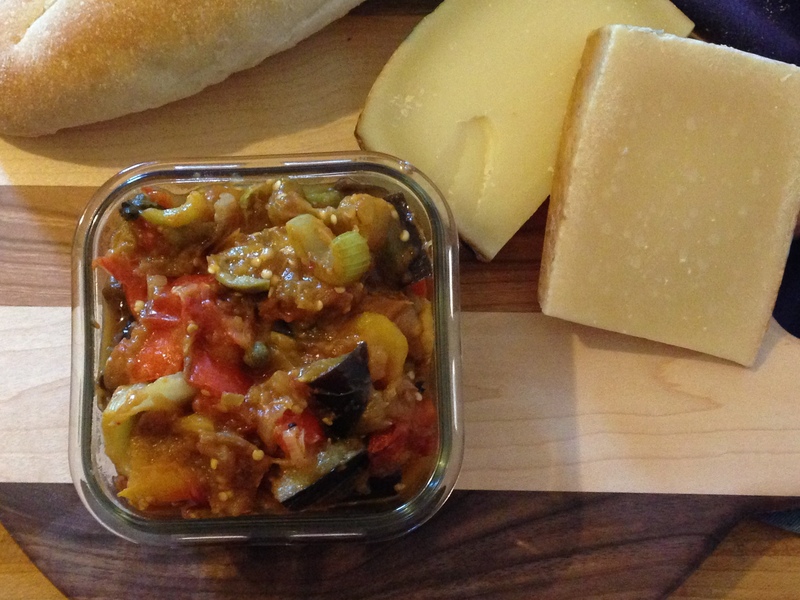 mmmmmm….am now in the mood for caponata. Every ingredient is first rate and when combined they’re even more amazing. Great recipe and photos! I made this tonight! AND your Italian long beans 🙂 Had to use up all of the farmers’ market bounty. Thanks for sharing your recipes, Suzanne. How wonderful, thank you for letting me know. Did you like it? I hope so. Thanks Liz. It looks really tasty Suzanne 🙂 Can I add grapes vinegar or water instead of wine vinegar? Absolutely, you do not have to add wine vinegar. I have even used balsamic. Thank you so much. Oh man, cheese and warm bread with this? Your readers are right. This will be amazing! I have made caponata a few times but have never got it quite right (too bland too mushy) this post is tempting me to try again and in particular to let it rest overnight. I really like the idea of serving it with bread and cheese. This recipe always turns out great. I don’t like it too mushy or bland and this one is good. Thanks so much. I do love me some tapas, even if it’s not technically tapas, any tapas is good! This sounds yummy, I love Italian family recipes! Me too Michelle, thank you. What a delicious looking dip! What a lovely dish to serve as an appetiser Suzanne! So perfect with some bread, cheese and wine to go with it. Totally agree, it’s a great appetizer or even meal. Thats all you need. Thanks Margot. My Mom made it for holidays and special occasions, not sure why because it’s not an elegant food but its delicious. Thanks so much. Hi Suzanne! Love the idea of setting this out as antipasti– but it would be good lots of ways– on pasta, in omelets… really great recipe! Thanks so much Rhonda! I agree. All I need is this dish in front of me and a big slice of bread. All the rest just leave them to me haha! Delicious! Yes me too, I could have as an entire meal. Thanks Katarina! Yes you can omit the olives. It will still be delicious. Thank you so much. It is, that one eggplant and errant tomatoes. Thanks Nancy. Sorry to see summer produce on the way out but look forward to Fall harvest! Will have to try your method of roasting aubergine, as I get so fed up with it taking so long to pan-fry. And I haven’t made caponata in ages. With a small jar of delicious capers bought recently it should be the perfect recipe for this weekend! It works wonderfully, I too get fed up with using the skillet. They soak up oil, when you roast in the oven it’s easy and uses far less oil. I really just brush them with olive oil and then drizzle a little on them before putting in the oven. I also had a container of capers just bought, love them, Thanks Johnny! When someone asks me which Region deserves to be visited in Italy I always reply Tuscany (of course, how could I turn my on my beloved region???) and Sicily. I had the chance to be there several times, I love it, I love everything over there. The food is outstanding and caponata is one of the best dishes you can have. Let me tell you that yours looks amazing, I hope you had a lot of bread! Suzanne, somehow I missed this post! This looks amazingly, delicious and sooo healthy. I just love every ingredient and all these veggies. Eggplant is probably my hubby’s favorite veggie! I bet all this goodness would go amazing on my gluten-free pizza crust…I need to try that! Thank you Brandi I love the combination of vegetables with the briny olives and capers and a splash of vinegar. It’s really good and YES this would be amazing on your GF pizza crust, I should try it. P.S apologies for being ‘lost’ whilst I am away on my travels, I’ve been neglecting the blog and my wonderful blogging friends sorrowfully! Laura, its impossible and not expected that you or anyone would keep up with blogs whilst traveling. No need for apologies. I have so enjoyed seeing your photo’s and the journal of your trip. Thank you, the caponata is really delicious. I don’t think my title really fits but I decided to try it anyway. It is a small plate and there is no word in Italian that I am aware of so I will borrow from Spain. ah what can i say! yum to eggplant. Yes I second that! Thank you. I have relatives from Sicily but my family was from Caserta. My great great uncle has family there. It is a wonderful treat, thanks Susan. It’s wonderful either as an appetizer or a light meal. Would love to know what beer you would pair with this, or would you? Its not sweet at all, I barely use any sugar in it. Red wine is always what I have just would be interested in beer, I love drinking beer with appetizer type food. Looks so good Suzanne! I love anything with eggplant! Thank you, I grew up having it frequently and it’s one of my favorites. This looks super good. I just had a kind of “meh” soup for dinner. I should have made this! It’s wonderful, caponata is great, I love it in an omelette or frittata also. Thank you so much.